Hello and welcome to our latest update about the team’s results, activities and goals. After a strong finish of 2017 it was time to look forward and continue on the path of progress. Here is a summary of our racing January. First, our iRacing drivers have all been promoted to higher licenses and have new cars and tracks to tame. Alejandro continues racing in the Skip Barber series in division 3 and the Weekend warrior series with Spec racer Ford (SRF). He is doing great with very good points and strong finishes. The team hopes that the trend will continue with the same trend he will climb to the top division in the world by the start of the next year, really impressive. Good luck! 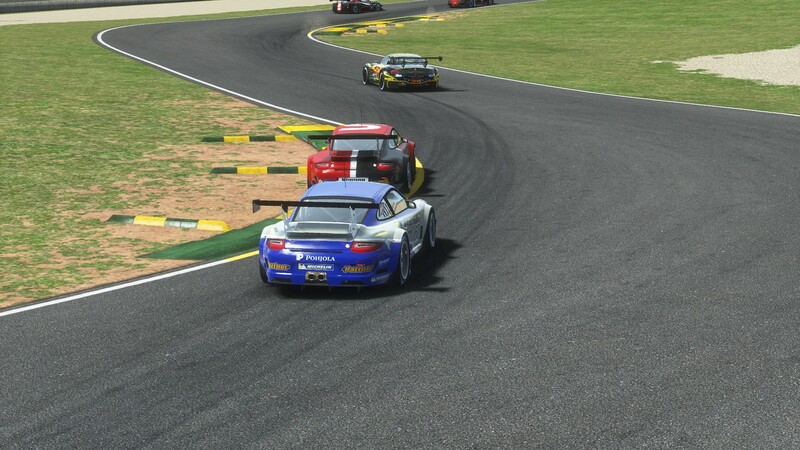 Ricker has been intensively testing different GT3 race cars for the IMSA championship on iRacing. His choice finally came onto the Ferrari 488 GT3 car. Ricker will use this first part of the year to focus on learning the car and tuning it well before doing competitive races in March. For Oliver the hefty and powerful Chrevrolet Camaro Xfinity car has been a lot of fun. He is working his way up and gaining experience. So far he has shown some good finishes but will of course need more time to get the consistency. The BVTCC Swedish championship on rFactor2 continues for Georgi and Oliver. Three race weekends had gone since and both driver’s improvements are obvious. After our driver coach Adrian joined us the car’s baseline setup is very fast and stable. This has led to one race win, one 3rd place and two out of three qualifying rounds in top 3. Looking back after half of the season gone we can say that first quarter we had the OK pace but were involved in too much trouble. But now the we have passed this part of the learning curve and during 2nd quarter we got double the points compared to 1st quarter. All this means we are now running 5th of 13th in the teams championship and Georgi running 8th of 26 in the drivers standings. Moreover, Georgi has started racing his favourite racing cars again – GT3 in the Rookie cup of well-known Simracing-gp.net. His car of choice is the Porsche 997 GT3. The basics are 2 lap qualifying and a 45 min race with an obligatory pit-stop for refueling. First race at Road Atlanta went well with P13/26 despite starting 22nd. The beast is quite understeery so good patience is needed to put the power down. And finally, Ricker has signed-up in the same league and will race along Georgi under the team flags. Oliver has made his debut in endurance race participating in the 2.4H Daytona at simracing-GP in the GTE Class. He struggled with a proper setup for his car but still bring it to the finish line in the 15th position. He is now working in finding a better setup for next round at Sebring the 7th of April. On the gokarting side the 4th round of the LeMans gokart was held 31st of January. Georgi, Oliver and Ronnie were there determined to do a good result. After qualifying 5th we did a very good race with strong pace and no mistakes we came 5th. However, this was our best race in terms of laps made and laps down to the leader. The trio is eager to perform even better in the next round. And finally the team is continuing the habit of doing team track days where we explore different aspects and parameters and learn together. Next one is next week and the focus will be the effect of anti-roll bars. That was all from us. Make sure to follow us racing live at our Youtube channel plus follow the action on our social platforms.